With so much digital content available on the web, including online debates and discussions, people want their voice and opinions heard now more than ever. On the other side of the equation, many websites and blogs are looking for ways to build their online community and increase user engagement with a more personal and direct approach, leading to better user retention, improved SEO, and more conversions. 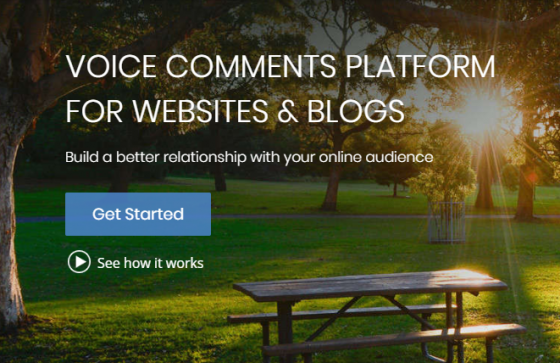 Enter Heyoya, a voice comments platform that takes you beyond text and lets you interact with your readers and have conversations as you would, face-to-face, while allowing site visitors share their opinions in a fun, fast,and easy way. Heyoya is a publisher-focused voice comments platform that allows users to build a better relationship with their online audience. Heyoya’s technology harvests big data insights to create a meaningful experience for both publishers and site visitors, and the platform provides comment solutions for websites of all sizes, from blogs to large-scale commercial websites. Heyoya offers 24/7 Support and an easy-to-use dashboard to moderate comments and view your analytics simply and easily. Available in over 20 different languages, users can record and track voice comments on the go using Heyoya on mobile. Monetization – Monetize below-the-fold advertising and notifications for additional revenue streams. Easy integration – Simply copy and paste one line of code, and be ready to go! Fast loading time – Heyoya loads in parallel with your website and won’t have any affect on-site loading time. Grow your community – Contact your readers directly and keep them updated and engaged. Rich Media – Combine voice with video, images, GIFs and more so your readers can express themselves better. Customization – Customize the Heyoya widget to reflect your unique brand and content. Notifications – Send alerts to your users about new content, special offers and anything else you want to talk about. If you’re interested in increasing your user retention, increasing your content quality, improving the SEO of your site, growing your brand affinity, and more, check out Heyoya’s demo, or go ahead and create an account and get started today.